People 2.0’s money-saving, back-office solutions assume all of the non-core, yet vital areas of your staffing or contingent recruiting business (e.g. payrolling, invoicing, risk management, compliance, etc. ), so you can concentrate on growing your business and placing top talent! People 2.0 makes onboarding new employees seamless and simple. Integrating with the Bullhorn platform, our secure, web-based employee portal allows you to choose from multiple, custom hiring packets that users can instantly access and deploy. All onboarding documents are completed and authenticated via our paperless solution and fully-integrated e-verify module, and data is automatically added to employee records for seamless payroll processes (e.g. W-4s, I-9s, and direct deposit forms). Furthermore, our employee portal allows you to easily track form progress and completion—making it easier to ensure everything is ready to go before an employee’s first day of assignment! 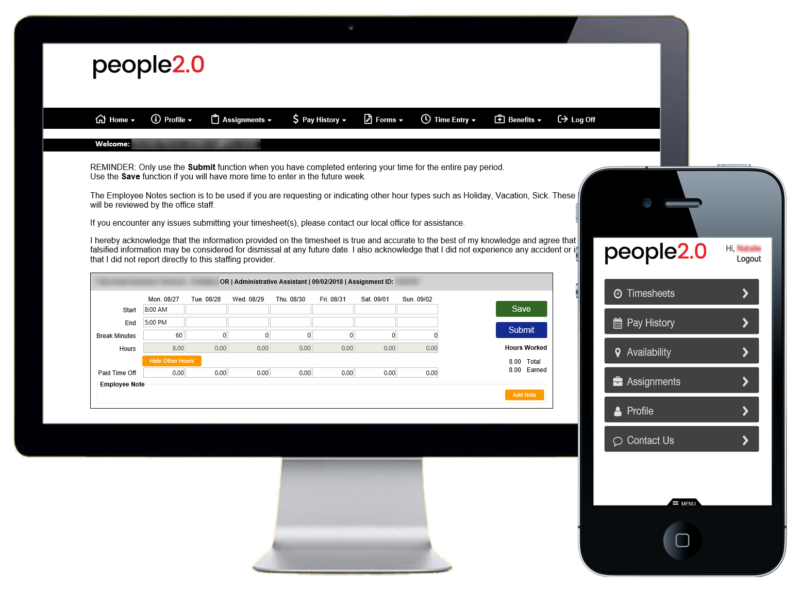 People 2.0’s time-entry model accurately captures all of your placed-employees’ hours to make sure they’re paid on time! Our system imports time files from physical clocks and vendor management systems, and tracks PTO, vacation accruals, and statutory paid sick ordinances—ensuring an employee’s time is exact and up-to-date. In addition to customized time-entry options for individual assignments to suit client needs and meet regulatory requirements, our web-time entry enables clients to approve an employee’s submitted time via their desktop computer or mobile device—making time approval even easier and more convenient! 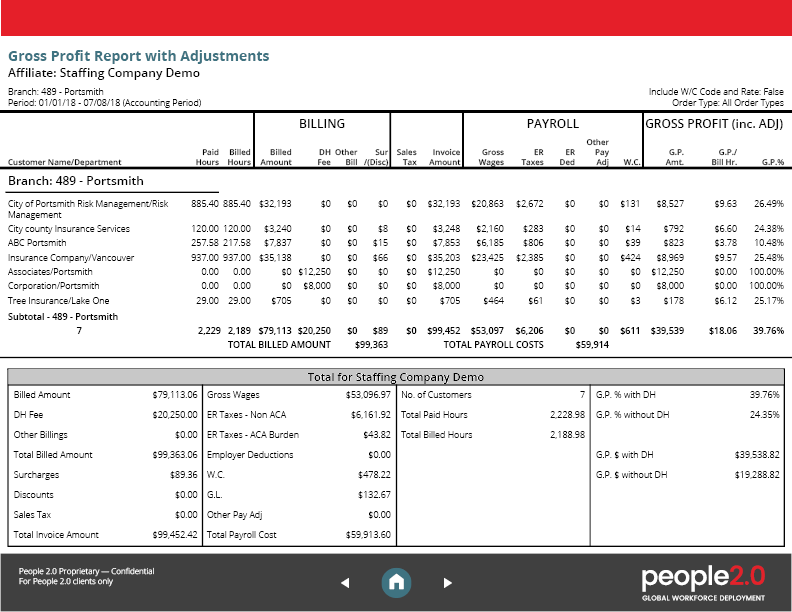 To ensure total, accurate visibility into your gross-profit margins, People 2.0 provides weekly, real-time reporting after payroll and billing have been processed. These reports include all employer burdens, including payroll taxes, ACA charges, workers’ compensation, etc.—providing you with a comprehensive look into where your money is going. Additionally, People 2.0 offers customized, scheduled reports, so you can have your gross-profit reports emailed directly to you at a time and date chosen by you!